I have heard it said that PANDAS flares are often not recognized or remembered by the child experiencing them, but that the parents of said child develop Post Traumatic Stress Disorder. And while I believe those who have said it did so in a light-hearted manner, there is more truth to this than even I have been willing to admit. If you’re a raging PANDA parent, bear with me. I want to allow others the opportunity to understand. Having a child with PANDAS is what I would imagine it is like to be a civilian in a war zone. Each morning you wake up from a fitful sleep with a Pollyanna-like optimism only to have your hopes dashed when your once loving child sits up in a urine-soaked bed, screams bloody murder, and then attempts to slap you across the face. Good. F$*@#ing. Morning. Throughout the day, you dodge bullets, both literal* and figurative, and you are held captive in your home by your adorable little fugitive who fears leaving the house for even a 5-minute car ride. You are supposedly willingly harboring this fugitive, though you cannot for the life of you remember signing up for such a demanding job. You save every last ounce of your now caffeine-fueled energy for the times when leaving the house is critical for survival (such as the need to purchase provisions) and throughout this lovely jaunt, you may expect your fugitive-turned-general to scream, hit, and threaten your life over a box of raspberries. If you make a list, you must adhere strictly to said list. Any deviation from the plan results in threats on your life for insubordination. In your home, silence is not only suspicious, but requires stealth-like agility to determine whether or not your fugitive has: 1) escaped the confines of the prison and is now half way down the block 2) devised a vengeful plan and is currently stocking supplies or 3) is happily occupying themselves in the other room. Oh wait. Scratch number three. When the day is finally over, you attempt to pick up the war zone and cry yourself to sleep while thinking of a time when life was just…normal. 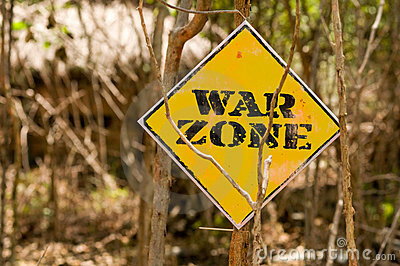 I honestly have never been anywhere near a combat zone so if I am completely off-base, forgive my ignorance. But this is what life felt like for at least the last six months of my life and for so many of the other PANDAS parents with whom I have spoken. If you have a child who was recently diagnosed, who is as-yet undiagnosed, or whom you suspect may suffer from PANDAS, I want YOU to know you are not alone. I know you are desperately searching for answers to heal your child. I know you want this nasty thing to magically be your cross to bear, instead of your beautiful child’s. I know you have cursed and cried and hoped and dreamed. I know. My little fugitive is currently obsessing over sneaking up behind me to “scare” me. He does this daily. I can literally feel the adrenaline coursing through my veins, causing my hands to shake, my vision to blur, and my knees to go weak. I am constantly looking over my shoulder, hyper-aware and insanely stressed. Last week, I was given a firm lesson yet again. It’s a lesson I think most mothers must constantly learn. I was blessed with a case of strep. Yes, strep. As in, one of the main triggers that sends kids into massive flares. Initially, I flew into a tailspin of worry that the strep was going to set our son back to where he had been a few months ago. But, thankfully, I just didn’t have the energy to continue my worrying. In order to fill up my son’s proverbial bucket, I had to take a step back from my crazy war zone to reflect and rejuvenate. The Universe brought me a wonderful reminder that I am truly a better, more loving and giving mother when I am vibrant and healthy. I immediately began a regular regimen of vitamins, supplements, and healthy foods as well as taking a few steps towards weaning myself off the caffeine habit and even meditating for a few short sessions. As of today’s writing, though it was not an especially good day for my son, it was a better day for me. My fellow parents, I want you to know that you are not alone in this journey. No matter how isolated you may feel in this moment, there are other parents who have stood on that island and looked longingly to the mainland for hope. I want you to know that your hope will not be in vain, though it might be a bit of a swim to get there. But you have the strength to build your raft and navigate to the shore, even if you have to pull it with your teeth. Just don’t stop swimming. *Ok…maybe not bullets. But shoes, sticks, rocks, or any random hard object could classify as a weapon here.